It was a month ago that a Texas lawmaker sparked a public outcry by proposing a bill that would limit the photography and filming of police officers. 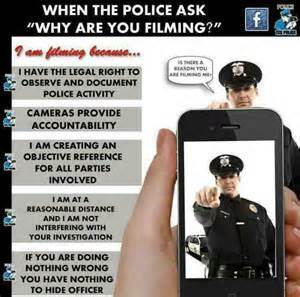 If passed, anyone caught pointing a camera at an officer from within 25 feet could be charged with breaking the law. The bill contains an exception for the news media. Representative Jason Villalba, a Republican, has dropped the bill and will not be seeking a public hearing for it. The bill was originally proposed to him by the Dallas Police Association and the Texas Municipal Police Association and it was intended to ensure the safety of officers and the public by creating a safe buffer zone between the two. Yes yes, we know very well that public safety was the issue. Give us a break..!! Unfortunately for the lawmaker, the public did not take kindly to the idea that their ability to capture cops on camera would be limited in any way. After a torrent of negative feedback flooded his office, Villalba instructed his staff to block “trolls” who threatened him and his family. In an email exchange received by The News after a public information request, Villalba coached his district director, Christine Mojezati, on how to handle the negative feedback. “Delete all voice mails without listening to them. Do not answer the phones today. Leave the office and work from home if you like,” one of his emails instructed. Villalba said the law is abandoned and is not likely to find success now or in the future. Colorado recently introduced a bill that would punish officers for interfering with photographers who are legally taking pictures of them. Los Angeles has agreed to train its law enforcement that public photography is not a crime. I’m surprised we do not already have that sort of law here. One thing the Police do not want is to be held accountable to the Public. My main drive car now has an in car camera.After witnessing multiple Police infringements of road rules.